Radar Series, used to create a Radar Chart (Spider Chart, Star Chart), is rendered to a circular graph and is used primarily as a multi-parameter data comparison tool. 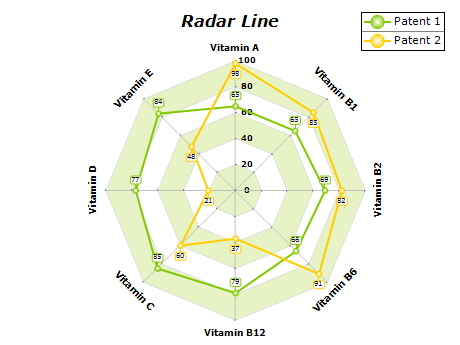 Multi measure radar chart is used to compare items by different, not related measures. Compared, areas covered by different data series form a general presentation of their relation, without losing the detailed information for every single parameter. Series that cover larger area are commonly considered to have a higher rating.